Recent violence in Egypt makes it appear to be a situation spiraling out of control, with six protesters already been killed in clashes with security forces and over a thousand arrested. And today is to be the big day: major protests coordinated on social networking sites such as Twitter are planned for Friday, although the government has already shut down the entire internet in the country and deployed elite forces. If they do manage to stage more aggressive protests today, expect a real harsh crackdown. 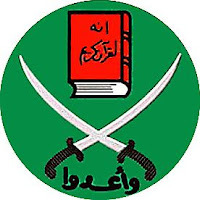 But the media narrative in the west of how these are people seeking freedom, justice, and better living conditions is only partially true: the unrest is driven and coordinated by the oldest Islamist political organization on the planet, the Muslim Brotherhood... a radical, jihadist group that would quickly dispose any real democracy and consolidate power. Protesters even fired two rocket-propelled grenades at a police station... does that sound like aspiring democrats to you? Egyptian Interior Ministry's statements asserting this have been mostly dismissed in the west, implying that it's just an excuse to maintain their grip on power. But it's time we consider that they might just be telling the truth... and that their enemies are indeed enemies of democracy, and the United States as well. The Tunisian protests that inspired uprisings in Egypt, Gaza, and Yemen were no Velvet Revolution with Vaclav Havel, either- more like a symptom of worrying Islamicization. While the corrupt, brutal Mubarak regime has little to commend it outside of stability, the alternative is likely to be no improvement. And in charge of the strategic Suez Canal? Since it's the MB that's organizing the protests, you can bet your bottom dollar that -like Lebanon today- the budding democracy would simply be hijacked by the Islamists, and dismantled from within as they install the theocracy they actually desire. And don't let former IAEA head Mohammed El Baradei fool you... this guy is no democrat either, and in fact is suspected by many to be secretly a member of the MB himself- sure would go a long way towards explaining the duplicitous behavior in dealing with Iraq and Iran. With the MB banned in Egypt, members simply run as independents... as El Baradei was planning to do in the next election. Seems events got ahead of the Vienna resident, and he doesn't want to miss out on the chance to score some badly-needed street cred back in Cairo. Barack Obama and Hillary Clinton typically missed the chance to support Mubarak, instead appearing to abandon him... as westerners default to rooting for the poor, oppressed protesters, ala Tienanmen '89. But again, if the regime is tossed, the ultimate result will be anything but democratic. Thankfully, it's not just about Mubarak, either- the military government that has run Egypt for 60 years is the actual power will not allow it, they've got no problem shooting people- at all. And I never thought I would contruct and use this sentence as long as I live... but I find myself in fundamental agreement with Joe Biden on this one... except the part about Mubarak not being a dictator. But diplomacy is about choices, no matter how unsavory- and even Slow Joe knows that. No matter which way this ends it is going to end badly; for Egyptians mostly, the U.S., Israel, the Middle East and the rest of the world. While the immediate problem is repressive dictatorships in the Islamic world. The underlying problem is the unchanging 7th century barbaric philosophy known as islam. Until islam is recognized as the cause for the continuing poverty and lack of progress of it's believers this situation will continue. You know, it just dawned on me! Could all the turmoil we are seeing in Muslim countries be an offshoot of perceived weakness on the part of the United States and her allies! I for one have always felt this President is firmly on the side of the Muslim world as a whole. Certainly he is the most antagonistic President as in his stance on Israel I have ever seen. As we now are at the point in which we have elected officials telling the Muslim world this country is full of racist hate and an administration that in almost every stance is extremely ” Anti-American ideals” why should one surprised that these radical Muslim Fundamentalists are taking their shots now? 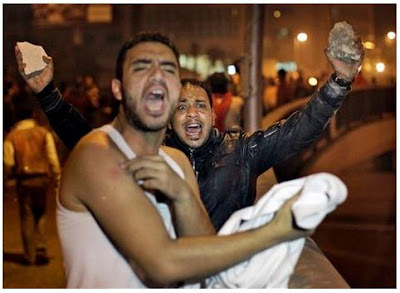 After all, the administration only yesterday as an example declared the Egyptian government was stable. No surprise from the blind mice running the show in D.C. now is it? Stop worrying about the worst case scenarios and envision a positive outcome. There are big and surprising things afoot that most have missed. This is merely the early stage of a period of rapid change that will spill out of the Middle-Eas­t and sweep the entire globe. Now to see if US leaders can stay ahead of the pace of change that threatens to engulf them as well. Hang on to your seats, this train is about to accelerate rapidly. The head in sand pose may temporaril­y hide danger from the ostrich, but the hungry lion has no misconcept­ions about the truly dire nature of that bird's predicamen­t.